Your favorite Beta testers are at it again! Al and I are back at it again for another AAR. This one we’re both going for Gold. We switched sides for this contest. I will take the AXIS and he the Allies. The game has been enhanced and improved making it much more fun and enjoyable. This is a world map we are playing on which many of you are familiar with and it’s been a blast for me to play single player. This is the first multi-player game Al and I have attempted with Gold... so it should be very interesting. 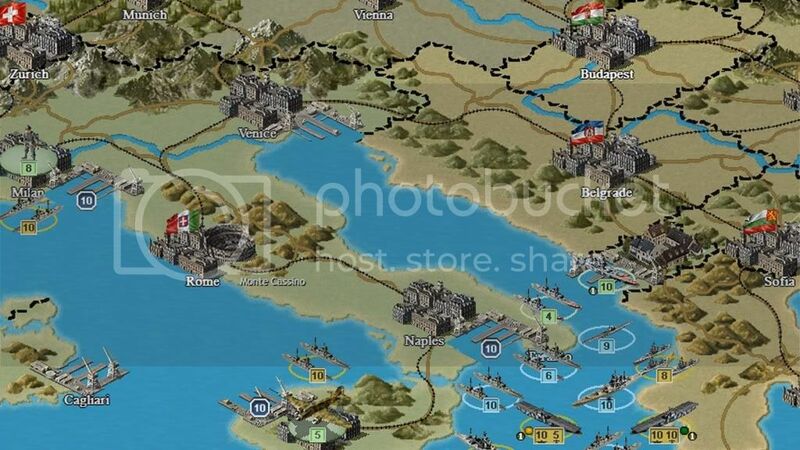 After playing on the WWI map it takes a bit of getting used to size wise… smaller unit movement ranges, etc. The player has to shift strategic thinking as a result. As most of you know Al and I are extremely competitive. I expect this game to be ugly and brutal. I hope everyone enjoys it. Feel free to ask questions. This is the starting strategic position for Germany on the Polish frontier. 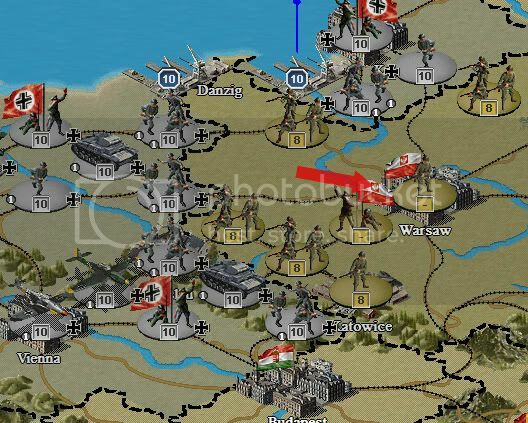 My objective on turn 1 will be Warsaw. 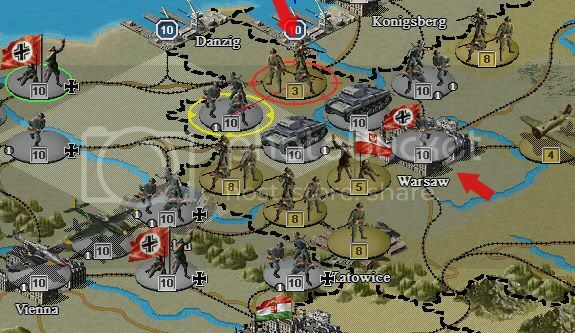 If Poland survives turn 1… the second German turn will focus on eradicating all Polish units with a look toward building experience. The attack on Poland begins. I struck with a fighter and then tactical unit first to reduce entrenchment levels and soften up the target. As you can see I took Warsaw… now moving to reducing the remaining Polish forces. Unfortunately Poland refused to surrender at the end of this turn. So next turn I will work on experience and destroying all resistance. Here is the Italian strategic picture… not counting East Africa where I have a special forces unit, tactical and DD. Italy has a number of units in production… a large army and navy. You can go either strong navy or army… but in my opinion not both. I will let Al wonder what I’m going to do with Italy. Okay now… onto Japan, my favorite country in Gold. Your strategic options with Japan are wide open. Long range goals can be China, Siberia, Australia, India… even the US. I may actually go for the later option... just to see if I can do it! Note the strategic situation on the map in China. In early game Japan can either focus on containing China, preparing for a war in the Pacific, really hammer China or a mix. With Japan you need to begin planning long term for your actions in late 41 and early 42. Poor planning will cost you the game. Note the amphib unit… I sent him to reinforce China and the garrison unit which will go to Manchuria to free up units. I decided to hammer 1 Chinese army with the ultimate objective of taking the city in the center of his line allowing me to build supply and continue an offensive drive. I was successful in destroying his army. Note that I also shifted my line around and brought in significant reinforcements. I’ve decided to give Al a hard time in China but not make it my ultimate focus. I will let him wonder what I am up to. I know Al well and if I went for a simple containment strategy he would make China a nightmare. So it's best to keep him off base. Al is the kind of guy who thrives on the challenge of a country like China. OK - so here we go again. Round 2 with Marc on an AAR. New game, new challenges. Should be fun. Down to business... the plan. 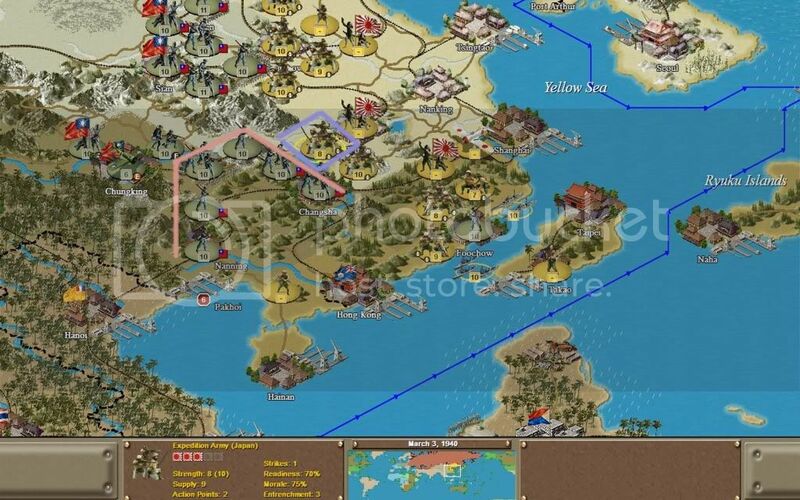 I am an old fashioned kind of a gamer; I dont see any value in going in to a strategic game without a sense of direction, and having played Strategic Command in its various forms I am firmly of the opinion that no plan tends to mean no success. So what to do as the allies? The key is to try and work out at what point the allies are able to seize the initiative away from the axis, and in particular how best to manage the Eastern Front where the global war will essentially be won or lost. 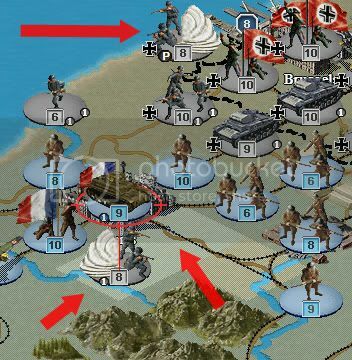 Until this point the allied player can choose to fall back and conserve forces, or try his utmost to delay the axis so that geographically there is less ground to take back. There are obvious dangers with each approach: fall back too far and too fast and the axis will run riot. Try too hard to delay and casualties will be so bad that the initiative may prove impossible to regain. 1. Priorities research above all else. This fits into the delay strategy overall. 2. Prioritise infantry, armour and air research for the Red Army, to prepare for the inevitable Barbarossa. 3. Prioritise UK research on anti sub - with a view to attacking the U boats at the earliest opportunity - , infantry and air. I will try to use UK land forces to delay where possible, but need level 1 weapons to do it and an air force than can combat tac air. 4. Prioritise US research on the navy and ground attack aircraft. All else can wait, becuase when I decide to try and wrest the initiative away from Marc in 1942/43 it will be via a US naval assault in the pacific and US air force attacks in the west to try and relieve the Red Army in the East. 5. 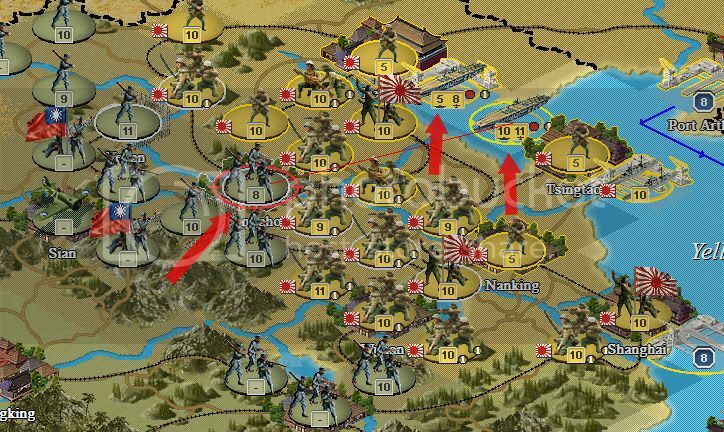 Try to get level 1 infantry for the Chinese - if this Gold GC plays out anything like the original then the Chinese have no chance unless they get infantry tech. a. Do virtually nothing throughout 1940 but defend, aside perhaps from a sortie with the doomed French Navy. b. Launch my first major operation at sea, via a UK assault on the U boats. c. Delay the Germans in North Africa using all the UK infantry I can in an attempt to prevent any nasty axis gains in the Middle East or India. d. Pray for Chinese tech, and delay the Japanese as long as possible. e. Plan my first land offensive in the European theatre as soon as US air power is ready. f. Peg back the Japanese via US naval operations in the Pacific in around 1942. Sorry for the long post, but now at least you know where I am coming from in this game. Japan is on the move. I brought in carriers to hammer Foochow before my ground forces attacked. This required upgrading 2 of them for range the previous turn. My ground forces attacked with overwhelming firepower. With entrenchments gone Foochow fell with little loss presenting Al with a strong front. This will provide additional options for the coming turn meaning I may not have to take a strategic pause to rebuild and allow supply to catch up. Foochow is critical to my plans as it is a supply source. One the German Front… it’s all about mopping up and building experience this turn. Al attacked my German units last turn making the job much easier. Germany now turns her eyes West. 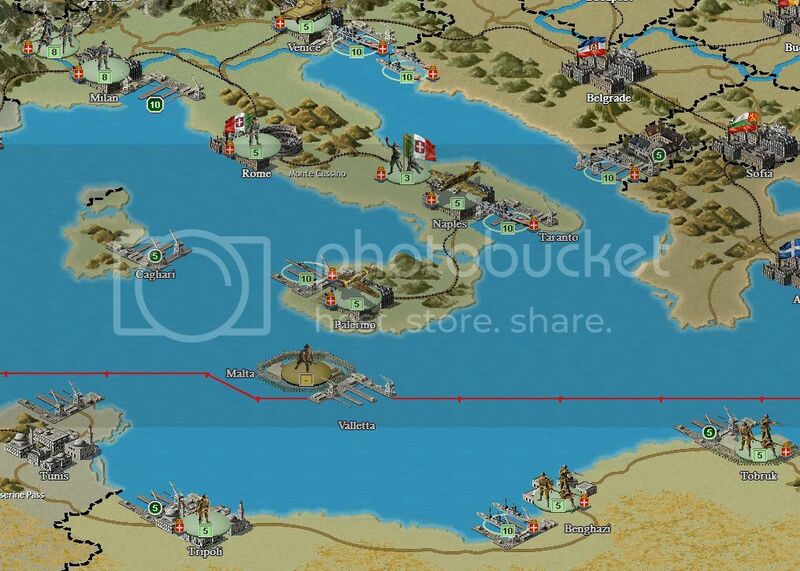 On a side note… the strategic war at sea is into the second turn. Okay… Axis turn 3 here game turn 5. 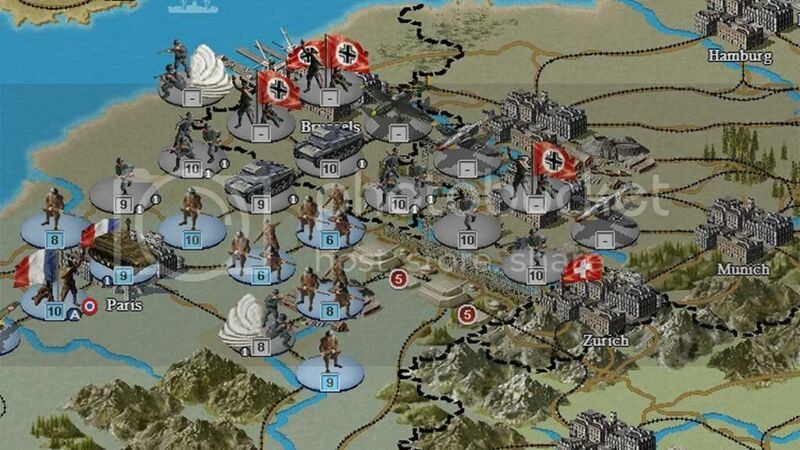 Germany is in the process of redeploying troops to the West and generally building up. Not much really to report. On the Chinese front things are hopping. 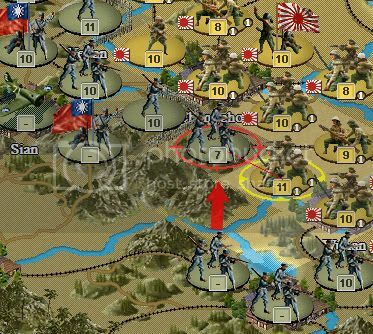 Al got a bit frisky and attacked a Japanese army that was understrength. He dropped it to strength 6 but more importantly his attacking army dropped to 8. His army was entrenched. I had special forces nearby that could de-entrench and I struck back. His unit retreated and I was able to pursue and destroy. Al has lost 3 Chinese armies in 3 turns. This is a great start for Japan as I really need to keep him off balance. If you look in the last picture you will see a Chinese corps behind entrenchments. I have 2 special forces units that can easily de-entrench it. 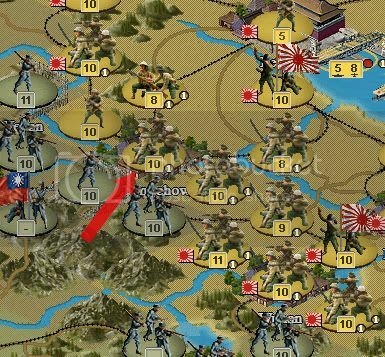 If you notice the strength of the Japanese units nearby are high… morale and readiness are high too. 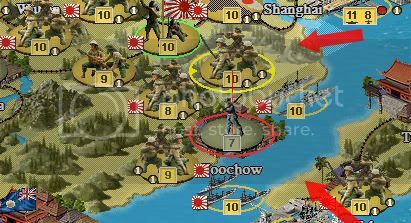 The Japanese have taken very few casualties the last 3 turns… This is critical as it allows me to continue to press him. A lot of Axis players that I play have ignored the war in China, hoping to simply contain the Chinese… instead focusing on the coming war in the Pacific. That is a mistake. Failing to fight the war in China well can easily cost you the game. It’s early and Al has a lot of wiggle room with China. He is very intelligent and dangerous. I have to be on guard. I simply can not afford any mistakes with China. Only on turn 2, and I have a double chit invested in infantry weapons, and with the SCww1 revamped tech system I know that, before too long, I am guaranteed a tech advance. Note I have not even had to sacrifice unit rebuilding - I have an army being rebuilt already and will have enough mpps to rebuild a unit every turn. Very good news. If the weather does me a favour, and it has turned muddy for Marc's next turn, I should be able to conserve units and rebuild faster than I lose. Could be a fascinating war in China in the long run. The designers seem to have wanted to make life a bit tougher for the Japanese than it was in the original. 2. Chinese generals are up. 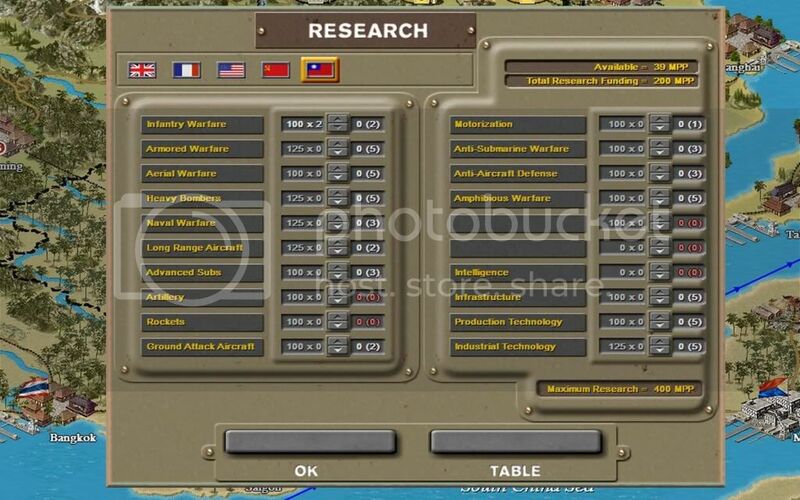 No image here, but all 3 of my chinese generals are rated at 8, and not the 8, 7, 5 that was the feature of GC. This is going to help too. 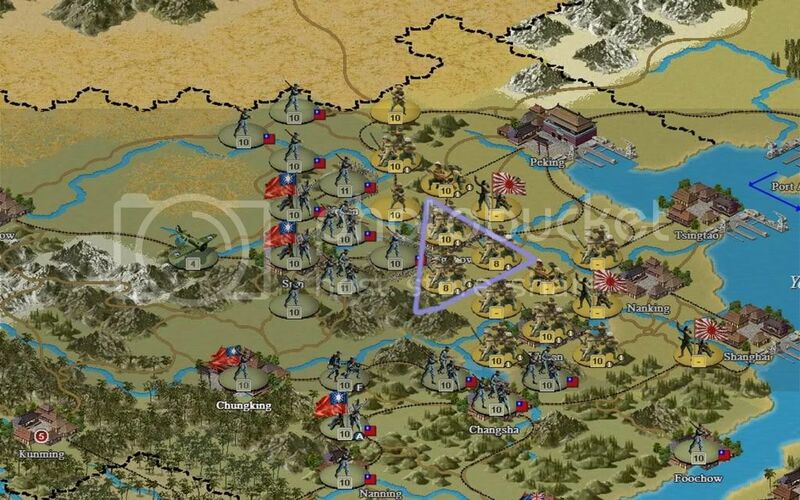 In every game you play you will do well to save the armies within this triangle. Marc's efficient advance in this area has ended my resistance quickly, but it is less of a problem than it might look. The only way across those mountains to the west is using marine special forces, and then their supply drops through the floor. Therefore the key to his advance will either be to the south of Changsha, which at present he seems to be ignoring, or along the northern edge of those mountains. This is a favoured route for many old hands of GC, so we will see in the coming turns if it is any harder for the Japanese in GC Gold. 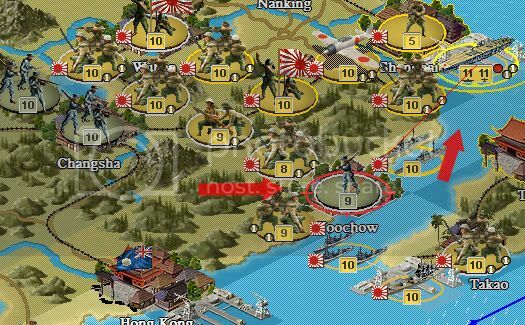 I am expecting to be able to rebuild chinese units quite quickly with the new mpp levels that are evident already, so I am fairly optimistic. I was busy conducting interviews for my show and working. So this was the first moment I had to get a turn in. 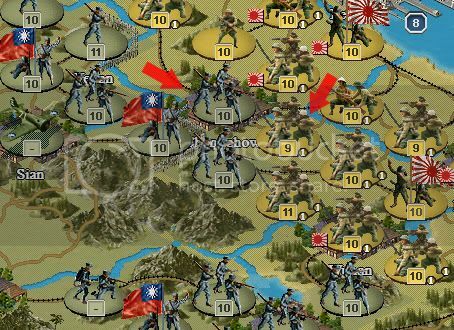 Heavy fighting again in China as the Japanese continue to drive on the Chinese. I again utilized my carriers. I almost nailed a 4th Chinese army in 4 turns. Repairing this one will hopefully keep Al from building a new one. Beyond that… Germany continues to build up. ... or so I see it anyway. As a newcomer to GC Gold there are bound to be some surprises, so I must be careful not to assume anything! Elsewhere my navy scooted around from hither to thither - more of that in a future post - and the French prepare for the inevitable German attack. I wonder what Marc will do after he has crushed France. Try Sealion? Go for Egypt? Hit Spain? All exciting stuff. My plan is already laid out in terms of making sure Africa does not fall cheaply, but I must be prepared to halt Sealion in case he tries it. No pretty pictures this time. 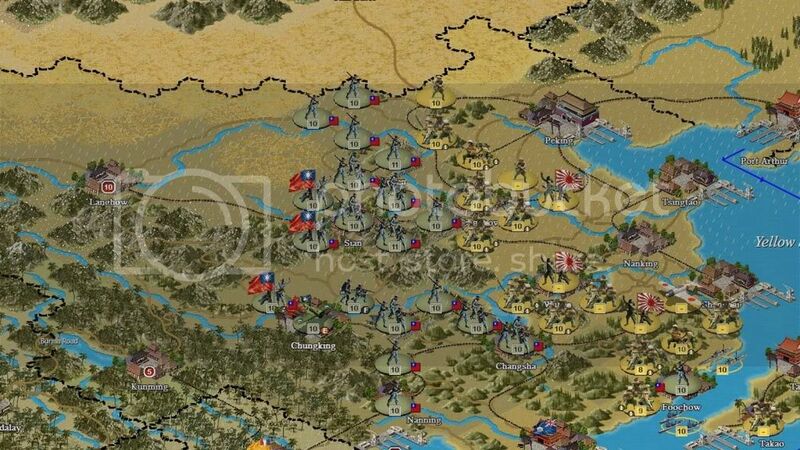 Using carrier air and ground assault I nailed that Chinese army I beat up last turn. So 4 chinese armies in 5 turns, with 1 production city captured. I think Japan is doing all right so far. Not sure what Al is talking about concerning Chinese MMP. It looks about the same as before. Based on the chart he has invest 300 into research and the rest into production. I have a few garrison units coming out shortly so I will be able to redeploy forces from Manchuria to China placing addtional pressure on him. Weather is poor in the west. Waiting for spring 40 and building up. Chinese used to get about 90-100 MPPs per turn, not sure why there would need to be a change, as concentration on IW pretty much evens up the fight, especially if a bump in fighter tech happens. Jap CVs will pay a high price for Chinese intercepts which stops the erosion of the allied forces. I'm sure Al will keep at least a couple of rebuilt formations in the Q to deploy at a moments notice, Chinese reserves always save the day. And guys, thanks for the AAR. My Chinese mpps are at just over 130 so it is an increase. That extra 30 or so is proving very valuable. Nothing otherwise to report - I am redeploying various global units for operations I will show you in the future, and waiting for the inevitable Japanese drive deeper into China. The second is that a script in France has given me a Polish unit that was not there in vanilla GC so France might just survive one turn longer. It is also the case that French supply is better than in vanilla GC - I had always wondered why supply in France was so low in the original, and it is put right here. 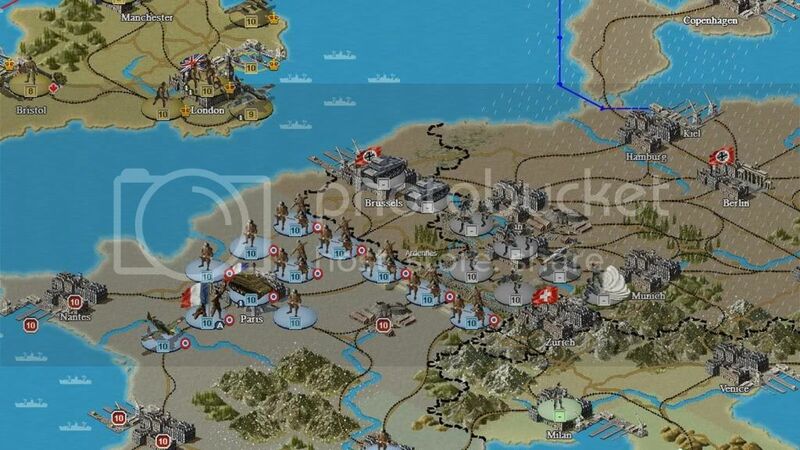 France may well hold on to July 1940 in this new version. Not enough game play yet, so early in the war, to make a big plug for buying the game in terms of new features. That will all come soon... but if, like me, you dont have time to fiddle with the editor and make changes to mpps levels, or scripts, or weather or the host of other things available - and let's also say that, like me, you are a bit wary of spending lots of time playing second party mods that have not been fully tested and are full of bugs, then even 5 turns into this AAR I can tell you there is enough going on to convince me that this is a definitely improved version of GC, one where the axis cannot roll its way to inevitable victory if you know how to do it, and it is worth the purchase. A good player in vanilla GC could always win as axis bar some outrageous bad weather luck. I dont think this is the case anymore. So stay tuned to this thread and I will keep you very clearly in the picture as the action hots up into 1940. And while I mention features that will play a big part in coming turns I am already convinced that forced march is going to have a very, very big impact. We'll play on and let you see for yourself...! Exactly right CH, who's got time to fiddle with the editor and balance testing takes way to long with all the variables SC now sports. I hope your right about that inexorable Axis momentum, I'm now concentrating on the Allies, going to make them a force to be reckoned with, if we can just get the Amis into the fight in late 42 early 43 as was historical. Okay... not much happening. Germany is waiting for good weather. Japan took a strategic pause to strengthen up and prepare for the next phase of my offensive in China and spent some MMP. No action to speak of. February 1940 and the Phoney War is in full swing. My French Army is now all at maximum with mpps left to spare, making me wonder whether it might have been worth the gamble of a tech investment early on. Didnt do it - never mind. I am going to keep my first offensive action under my hat for now, but I am preparing it. 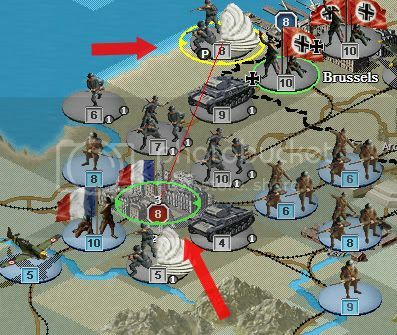 I dont want to give Marc a free ride through 1940 and 1941, and harking back to my very first planning post I think the allied player needs to try and put the odd brake on the axis early doors otherwise momentum can be huge. Marc, I think, has made an error. The unit highlighted in a delightfully lilac box is his elite expedition army. 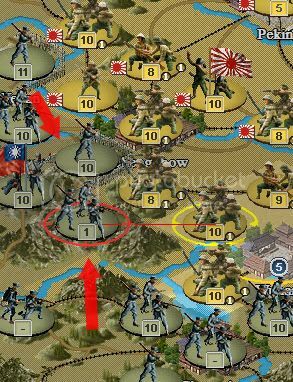 This is a vital unit for Japanese fortunes in China, as it is the one unit with the experience and oveloaded power to knock the hell out of the Chinese. However he attacked across a river with it last turn and it has dropped to strength 8. This will cost it one of its experience stars when it reinforces, and that is good for me. Also I have highlighted the "Changsha Ring" as I call it; a defensive perimeter in the south. I have nearly got this fully established now, and it will be a pig for Marc to break it. With good weather and lots of carrier support he will be able to grind it a bit, but all the way to Chungking? - virtually impossible. I suspect he will sensibly take the southern edge as far as Nanning as a launchpad to activity in Indochina. I've begun my offensive on Foochow in the South. I have a plan and so far I am on schedule. The Weather in the West has been terrible... Germany is waiting for fair weather. China standing firm, and another army takes to the field. Waiting now for level 1 infantry, and then all will be very good. In the west Mussolini has not yet taken the bait, but he might soon... I have so many French mpps sitting around doing nothing I was even able to invest in some French diplomatic action. Not sure if this mpps excess is also a new feature in Gold: I dont remember having so much to spend, and I have a lot of units grouped round Paris now so hope to be able to significantly delay Marc. 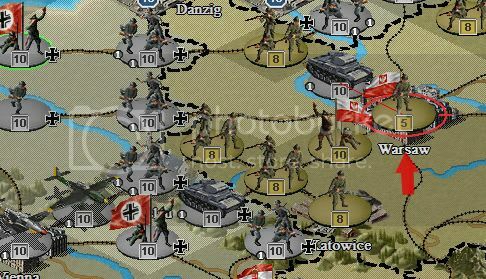 I get the definite impression that Hubert has set up Gold to give the axis player a much bigger 1940 headache than before! Okay... the weather was okay in Western Europe so I jumped early... beginning of April 1940 and took Belgium. Al has a wall of French troops waiting. Pictures next turn when I hammer him. (if the weather is good) In China... the weather was poor so I took advantage of the poor weather built up and redeployed troops. It's gonna get interesting quick! OK - Marc took Belgium though the RAF gave some decent air cover and the Luftwaffe was bloodied somewhat. Signifantly I just got level 1 infantry at the end of this turn, so now China becomes a massive headache for Marc. Still a little bit of movement I would like to do, but ready for the assault, and ready with enough available power that Marc will need some time to wear me down. So - it's game on!! Yes… we have an AAR going on here. I want to apologize for the delay. It’s been a little hectic for me. Holidays are coming up and I’m working hard to get my next show out before they arrive. Okay… Germany began the offensive in the West this turn. I used my strategic bomber to work on Al’s entrenchments bombing 2 armies before I sent in Ground forces. He has a lot of units piled up for me to chew through so I’ve decided to take it a bit slow and focus on experience. I brought in a couple airborne units. One landing in the South of France. I had hoped to capture the city there… but Al had a corps there that had arrived from Syria. (I guess) so I will settle for blocking that unit heading north to help defend Paris. I nailed 2 of his armies and damaged a corps. I also engaged a British fighter twice during bombing. In Japan I went all out on Foochow in the south. I brought in carrier air… ships to coastal bombard and multiple ground units. It was a very expensive attack but in the end I took the city. I am operating under a very tight timetable. I need to continue my advance in China no matter the cost. This is the second production city I have captured and the 5th Chinese unit destroyed. I am pushing hard… also bringing up units. Now the next phase of my invasion of China can begin. 1. Italy has been "encouraged" to join the war because of my decision to weaken garrisons in the Mediterranean. This was just what I wanted, and I hope to be able to do some mischief now. 2. The loss of Foochow in China was expected, and the corps was bought straight back. 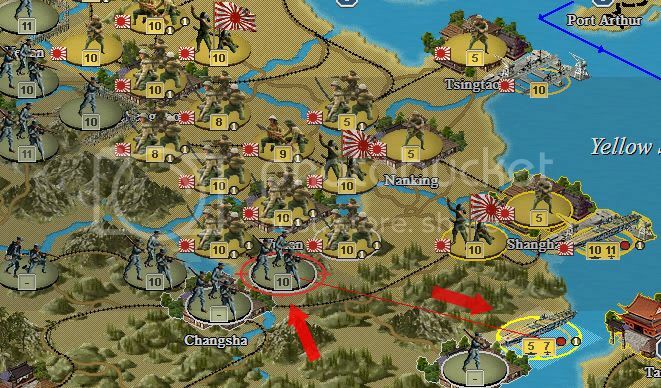 A number of Chinese units were given new weapons that turn, so my line will quickly stiffen. The swap unit feature that is now present in Gold (hold shift and highlight 1 unit after another and they will swap positions) will be very useful here. 3. In France I decided to counter attack. 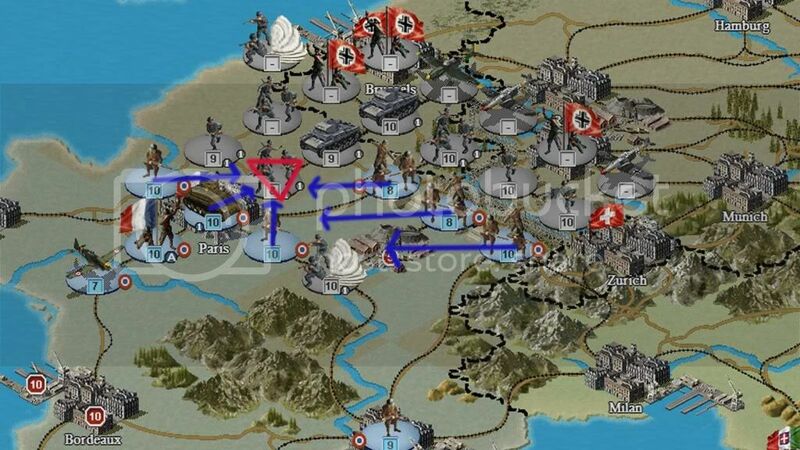 That may seem foolish, and it may well reduce my defence by a turn, but to sit there and be destroyed by air and armour was something I did not want to do, and I was lucky: the army I hit chose to retreat after my last attack, and it retreated right into range of units on the Maginot Line who were able to destroy it. To knock out a German Army at this stage is a big bonus and may prove significant for future operations in North Africa or the UK. 4. Marc has used airborne forces in France - 2 units. This surprises me - Norway is currently untouched. What is he getting up to here?? No photos this time around. Germany pushed up to Paris this turn. Al pulled a slick move last turn and destroyed a German army. I told you he's dangerous. If he attacks me again this turn I should take Paris next turn. Got a diplomatic victory with Spain of 12%. Japan advanced further into Southern China and began preparing to take more production away from China. Al has a lot of Navy in the Med at the moment and I'm wondering if he has enough to defend England. He's not seen any of my navy for several turns and I am betting he's wondering where I am. Remember my point in the long term plan about knowing when to pull back and when to try and throw a spanner into the axis plan? I looked at the global map and decided to throw that spanner this turn. The army in the triangle was the focus, and I put everything into hitting it. No sense in leaving Maginot units doing nothing, so first of all used them to wear it down, then a corps to do more damage and lastly my precious armour to finish it off. I got lucky and took only 1 damage - it could have been 2 as predicted in the combat precalculator that gives you a rough idea how much damage an attack will cost. I got a corps out in front of Paris again to act as a bit of a block, and hope to still be alive next turn. Marc has lost 2 armies in his assault on France - and I am happy. My second spanner was pre planned. By getting Italy into the war against Mussolini I have given the French Navy an opportunity to do some damage before it quits the war. I scouted Italian ports and then threw ships into the Adriatic. The result was not all good - I found a sub but it dived and escaped, and then I could not move my carriers close enough to finish off a cruiser that was exposed (bad planning on my part - no excuse really for attack carriers being out of range! - shows how mistakes play a big part in SC..) but I have enough force in the Mediterranean to be fairly confident that I can do major damage to the Italian Navy next turn. I must also balance this by saving enough of my RN to be able to defend the shores of Britain should Marc attempt Sealion. Finally I had laid a trap for the Italian destroyer unit that in vanilla GC used to lie off the east coast on Africa. It wasnt there. Either my trap was too obvious and the unit escaped, or the game has changed down there. I decided to invade Abyssinia from the Sudan anyway, just to see what can be found. Addis Adaba was found unoccupied, but I could not take the city this turn. Can Marc get a garrison in there to prevent its early capture? Okay… Al’s been pretty lucky against Germany. I had 2 choices this turn. Work on reducing his armies around Paris and take France next turn or go for broke by hammering Paris with everything I have and taking casualties in the process. I decided to go for it all and hammered Paris with everything. If successful this will allow me the option of invading England and allowing the Italian fleet a fighting chance in the med. 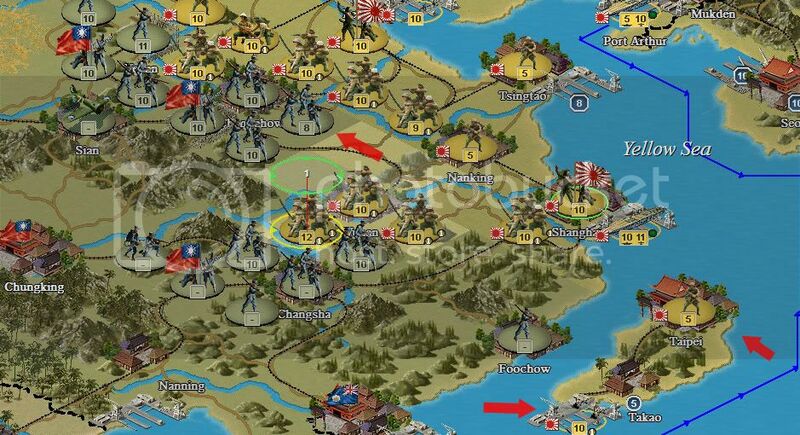 On my first round of attacks… I used my fighters, Corps and an airborne unit to reduce entrenchment levels. I saved my Tactical for later. Notice the second airborne unit. I am planning on using it to take Paris. France surrendered at the end of the turn. 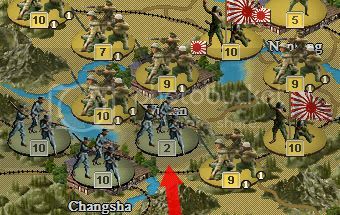 Japan launched some limited attacks against China. I expect to be able to launch a major offensive next turn. Al has deployed a number of units. It is going to get interesting. 1. Try for Sealion before winter. 2. Hit Spain, although diplomatic axis activity in Spain already suggests that he is not going to invade. 4. Take Norway first, and then do one of the above. 5. Attack Russia very early. 6. Attack the Balkans - but that might anger potential axis partners, so unlikely. In Asia my Chinese now are a brick wall. Cant see Marc going anywhere fast there, but we will see. One final new thing: there is a new "player" in the game now called Minor Nations. This appeared with the fall of France and my decision to support the Free French. Income is small, but I have one unit and two mpp producing centres so maybe sometime in the future the Free French can play an active role!